The symbol of a raised fist has amassed myriad significance throughout the epochs of history. Civil disobedience, resistance, rebellion and militance, social revolutions and gender struggle, we see the fist coming into its own - standing alone, severed from the body, disconnected from the mind and heart. A fist without a body suggests a body without a hand; a symbol of a fist imparts the rest of the body invisible, unneeded, ghostly. A fist has its own consciousness, it can entice the head and the body, lead them astray into the fervour of struggle. A clenched fist does not think, does not feel, it strikes. It is the hammer that breaks the mirror of reality. Either Way We Lose renders the iconic image of a raised fist in its augmented vanity. It becomes a symptomatic and fragile representation rather than a radical tool for transformation. 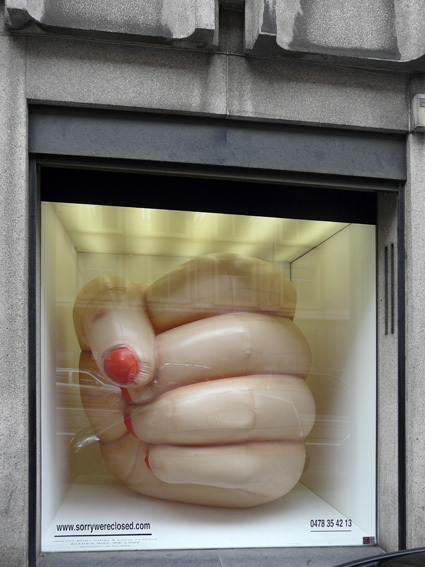 It is blown up into a balloon, an oversized boxing glove, a hand of a "Queen Kong" displayed captive in vitrines and galleries. Squeezed in between walls, too big to fit, the fist is held hostage by an institution, confined and unfree. 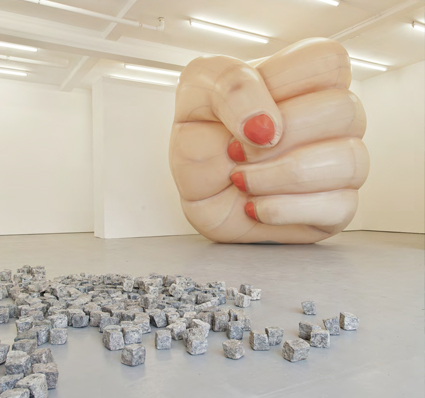 The inflated sculpture resembles an object made for mass amusement, hinting at the unfortunate karma of revolutions and their predestination to become an attraction, to entertain, to sell well and to sell out.